Assistant Chief Constable Scott Chilton has responded to the results of the National Rural Crime Survey 2018. “The National Rural Crime Survey gives us a real insight into rural communities’ fears and perceptions of crime. 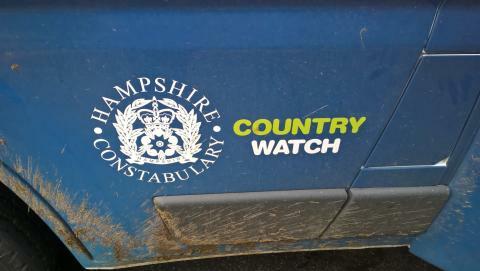 “In recent years, Hampshire Constabulary has been working hard to support our rural communities through our dedicated Country Watch team. “This team works closely with our partners to tackle poaching, agricultural plant theft, fly-tipping, wildlife crimes and a range of other offences that matter to rural communities. “In addition to this dedicated team, our local rural neighbourhood teams work closely with their communities to prevent and tackle rural crime. “As we talk to rural householders and businesses, we emphasise how important it is for them to report every crime to us. “Using the information gained, we can analyse crime hotspots and tackle the organised criminal gangs that target isolated properties and land. “I am attending the launch in Harrogate today (25 July) of two new national strategies for wildlife crime policing and rural affairs. “Published by the National Police Chiefs’ Council, these strategies will ensure that we work with colleagues in other forces to share best practice and tackle criminality more effectively. If you have information about rural crime, call us on 101 or 999 in an emergency. You can register for free crime and community information on www.hampshirecountrywatch.co.uk.